Definition at line 33 of file CNormalCall.h. Definition at line 36 of file CNormalCall.h. Definition at line 25 of file CNormalCall.cpp. Definition at line 31 of file CNormalCall.cpp. References mFractions, mName, mType, and setFractions(). Definition at line 109 of file CNormalCall.cpp. Definition at line 139 of file CNormalCall.cpp. Referenced by createCall(), and setFractions(). Definition at line 121 of file CNormalCall.cpp. Definition at line 149 of file CNormalCall.cpp. Definition at line 262 of file CNormalCall.cpp. Definition at line 130 of file CNormalCall.cpp. Definition at line 272 of file CNormalCall.cpp. Definition at line 56 of file CNormalCall.cpp. References mFractions, mName, and mType. Definition at line 41 of file CNormalCall.cpp. Definition at line 158 of file CNormalCall.cpp. Definition at line 200 of file CNormalCall.cpp. Referenced by CNormalCall(), and operator=(). Definition at line 267 of file CNormalCall.cpp. Definition at line 277 of file CNormalCall.cpp. Definition at line 242 of file CNormalCall.cpp. Definition at line 221 of file CNormalCall.cpp. Definition at line 256 of file CNormalCall.cpp. Enumeration of members The members of a call have to be kept in the correct order since the order of arguments to a call matters. Definition at line 60 of file CNormalCall.h. 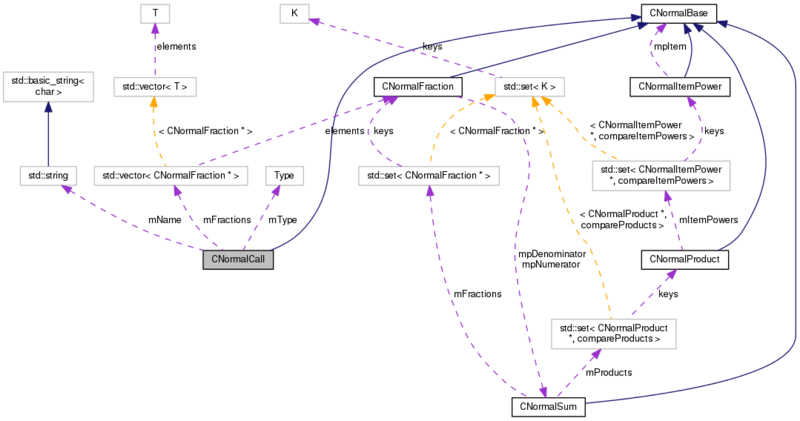 Referenced by add(), CNormalCall(), getFractions(), getSize(), operator<(), operator=(), operator==(), setFractions(), simplify(), toString(), and ~CNormalCall(). Definition at line 48 of file CNormalCall.h. Referenced by CNormalCall(), getName(), operator<(), operator=(), operator==(), setName(), and toString(). Definition at line 53 of file CNormalCall.h. Referenced by CNormalCall(), getType(), operator<(), operator=(), operator==(), and setType().